Hot cars, cool visual effects, and a hundred and fifty minutes of mind-numbing CGI-rendered metallic mayhem. It’s pure, unadulterated escapism. What more could you ask for in a popcorn movie? Oh, and let’s not forget the SSSSizzling hot as ever, Megan Fox, AKA Mikaela Barnes in the movie. What, you think I’d shell out my hard-earned moolah just to watch a couple of over-sized metallic changelings duke it out on the big screen? No freaking way! I need my eye candy. While it is undoubtedly a highly entertaining flick, with plenty of adrenalin to satisfy even the most hard-core of action figure fanatics, I found the plot rather flimsy and, well… full of loopholes and inconsistencies. Oh yes, there are quite a few of them and if you just pry your eyes away from Megan Fox’s long luscious legs for a moment, and open them (your eyes, I mean) a wee bit wider, you’d see them staring right at you… point blank. Now, I’m not gonna go over Ms Fox’s white pants that miraculously remained clean and unsoiled (and I bet they smelled good too) all throughout the action sequence, it’s been discussed to death already. 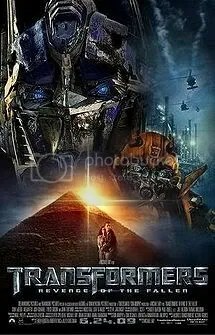 What did bother me the most was the fact that, even after the explosive downtown rumble between the Autobots and Decepticons (with of course, the humans in-between) in the first transformer movie, the public is still unaware of the existence of these alien robots on their planet. Don’t you find that odd? I mean, in this day and age of CNN, instant messaging and camera phones, the chances that it will go unnoticed is, well… Infinitesimal. Can you imagine a herd of elephants rampaging on a New York City street, in broad daylight, without anyone noticing? Niggles aside, I still enjoyed the movie. And that is what’s important, right?